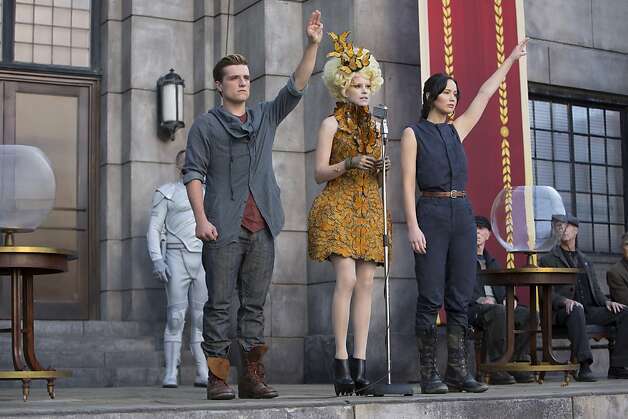 “Hunger Games: Catching Fire” doesn’t settle for halfhearted gestures. Its dystopian society isn’t somewhat horrible but truly horrible in the way of real-life totalitarian states – soul-killing, unreasoning and thuggish. The people who carry out the government’s dirty work are perpetually angry, because psychopaths rise to the top in such an environment and because anger must be nurtured so as to ward off guilt. And we’re not merely told that the president is evil; we see him operate, and he’s a smiling, genial monster. In the lead role, Jennifer Lawrence does not act like someone in an action movie but like someone in a life-and-death drama that happens to have lots of running and jumping. Director Francis Lawrence makes sure that not a single performance is tossed off. Every effort is made to portray this awful future world as something real and to have the actors react with the right sense of terror and entrapment. These are all solid virtues, and they take the movie far. But “Hunger Games: Catching Fire” is based on the middle book in a trilogy, and that means that it doesn’t really end. Instead it stops just as it’s getting interesting. Also, it relies too much on the success of the original story, with a plotline that calls to mind its contours. There are empty action sequences that contain no suspense at all: When Jennifer Lawrence is attacked by a pack of orangutans, does anyone worry that the orangutans might win? Still, “Catching Fire” always revives, and it’s only in two or three places that the movie dishes out action for the sake of action. It runs 146 minutes and would have been better at 130, but 110 would have been too brief.